The artwork of the late John Daniel will be exhibited May 10 through June 16 in Reavley Gallery in The Cole Art Center @ The Old Opera House. 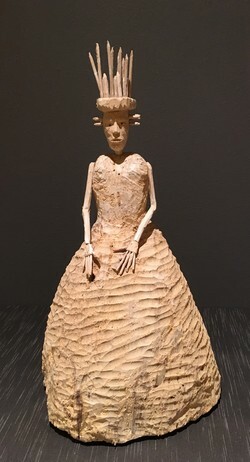 NACOGDOCHES, Texas - The Stephen F. Austin State University College of Fine Arts and School of Art will present an exhibition of work by former SFA art professor John Daniel showing May 10 through June 16 in Reavley Gallery in The Cole Art Center @ The Old Opera House. A reception is planned for 5 to 7 p.m. Saturday, June 2, at The Cole Art Center. Daniel, who died in 2015, began teaching at SFA in 1967. In 1997, the John and Doris Daniel Scholarship in Art was established and is ongoing. In December of 2005, Daniel became professor emeritus and retired after 38 years of teaching sculpture, design and drawing. In 2007-2008, a retrospective show of his work had venues at both The Cole Art Center in Nacogdoches and at the Museum of East Texas in Lufkin. Daniel's artwork is in collections in Nacogdoches and across Texas, as well as in other states. The exhibition and reception are sponsored in part by the SFA Friends of the Visual Arts, Nacogdoches Junior Forum and The Flower Shop.